How Should Harper&apos;s Bazaar Style Susan Boyle? As we suspected they might,Bazaar has gone the first-lady route with Boyle, posing her, at a mansion just outside London, in what an editor calls "the most classic beautiful pieces of the season," which run the gamut from Tadashi Shoiji to J. Crew: an accessible (for the most part) wardrobe for a woman-of-a-certain age. So how does she look? Good. By which I mean, she looks like a more polished version of herself. Despite her newfound fame, there are a lot of things Susan Boyle doesn't do. She doesn't go on holiday or go out much. She isn't into fashion or gourmet food. She isn't married, doesn't have children, and hasn't seen the world. When I ask her if she's been shopping, for example, she shakes her head. Not even to Selfridges? "Where?" she asks, half joking. But feeling financially secure must surely be a bonus. "Hey, you don't just do it for the money. I don't do it for the money, babe! Who do you think I am?" (First of all what does shopping (for example) have to do with marriage and children? She's supposed to have suddenly taken them all up in the past two months? And love how they all, in sum, are supposed to say "empty life" to a fashion mag reader!) If people are looking for sudden outpourings of emotion and a dramatic shift in personality - in short, drama equal to that which brought her to us - it looks like they'll be disappointed. But for those of us who genuinely wish to see the singer with a sustainable life and a career commensurate with her talents, well, this spread should prove reassuring. And one hopes her joke, "as long as I don't break the camera, I'll be fine," is in fun. Love the peacock blue with Susan's fair complexion - even if this doesn't look like something she'd ever wear in real life. And how pretty is her makeup? The What Not to Wear outfit! Knee-length skirt: check. Classic heel: check. Tailored coat: check. Hint of color: check, check. They'd probably suggest this was appropriate for picking up the kids or something; seems like a good getup for Susan to wear to the studio, no? Okay, this is officially my least-favorite, because I can't help thinking "Grimace" and because, sassy as it looks here, you just know that shape could get Helen E. Hokinson-frumpy with very little work. The perfect concert gown! Nice work, Bazaar. Hm. The obligatory "woman of a certain age" sequins. I get that a touch of sparkle works on stage, but this feels a little Barbara Bush. This gown, at $490, is among the shoot's most expensive. On the one hand, I like that they're keeping the prices somewhat realistic. But on the other, perversely, I'd love to see Susan in the priciest gown they've got! Or at least a nice Carolina Herrera. That said, love this one. 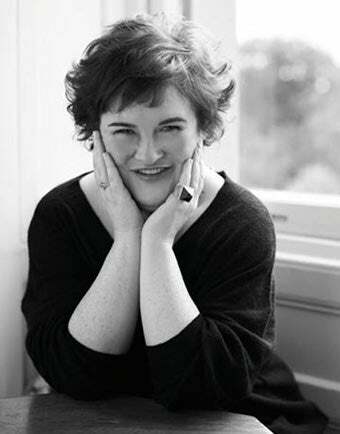 Earlier: How Should Harper's Bazaar Style Susan Boyle?